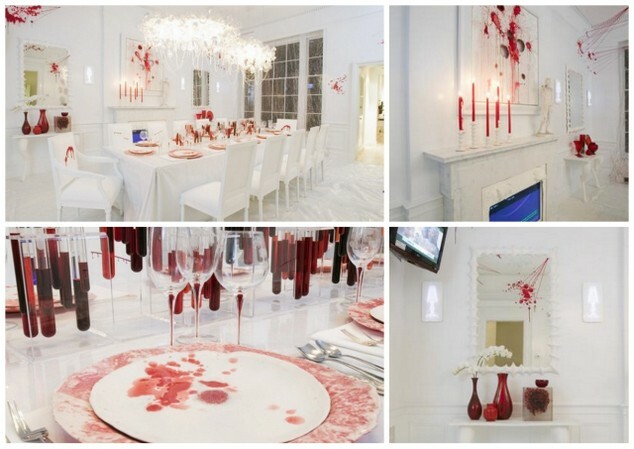 When I first saw Amy Lau’s incredible Dexter-themed dining room a few years ago, I knew it had dinner party potential. Hence the name of this party concept, although it doesn’t have to be for Dexter; the ideas here would work for a generic serial killer or (with tweaks) a mad doctor party. What I like about this concept, aside from the stark beauty of the red and white color scheme, is that it can be quite cheap to produce. 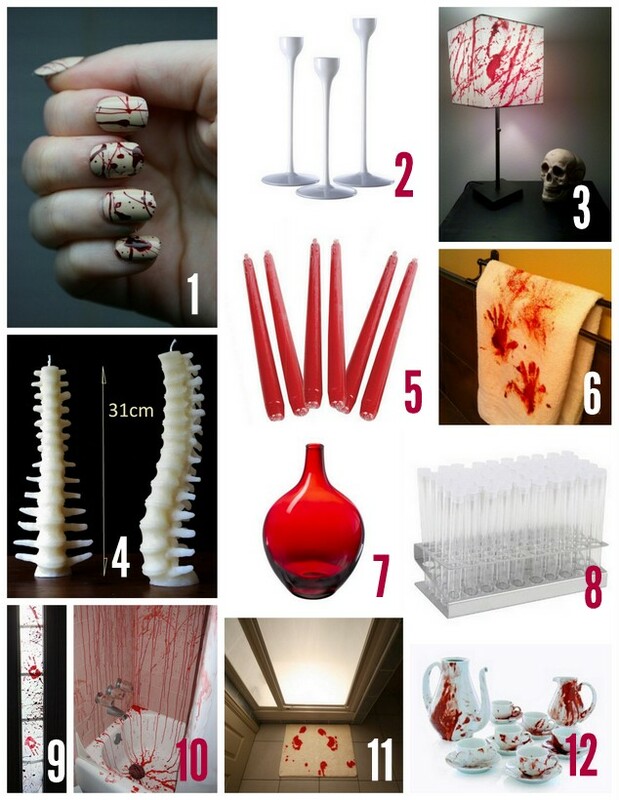 Furniture & floors can be covered with white sheets, tarps, or tableclothes, and most of the accent items are inexpensive (washable fake blood spatter (recipe below), red yarn, red taper candles, cheap red vases, white candlesticks, & test tubes). Mix water + corn starch first, then mix in the other ingredients. 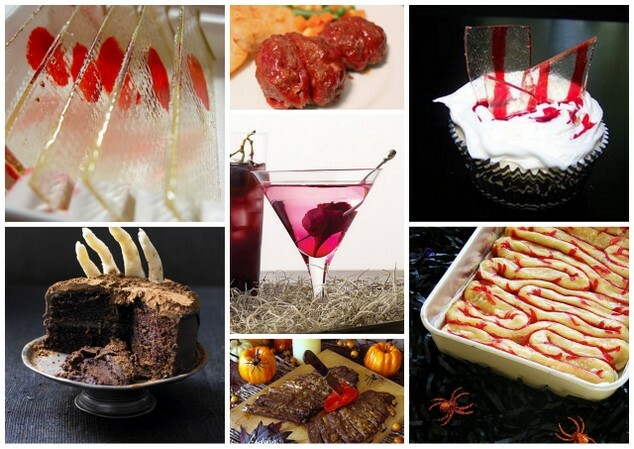 Add some green food coloring or chocolate syrup if you’d like your fake blood to have a more realistic color. Be sure to do a test patch on all surfaces you intend to cover (I’d recommend sticking with glass surfaces and bleachable fabrics). Apply with spray bottles, hands (for bloody handprints), and old paintbrushes. Dexter blood slide suckers from Forkable. Meatloaf brains, by Lauren’s Latest at Tasty Kitchen. Bloody murder cupcakes by Jai on All Recipes. Puff pastry intestines from The Knead for Speed. Bleeding Heart martini from Martha Stewart. Adam’s Ribs from Better Homes & Gardens. Zombie cake from Lily Vanilli’s A Zombie Ate My Cupcake . Not pictured (but awesome): bloody jello shot-filled syringes; frozen eyeballs; meatloaf hand; ogre eyes hot cocoa; ladies’ fingers and men’s toes. Again, decorations should be simple, mostly white with a few red accents. You also only need to decorate the dining area and maybe the bathroom. Other areas can be cordoned off with crime scene tape (example). Halloween splatter nails by Never Too Much Glitter. Also: imitate Dexter’s blood-spattered look. Blomster white candle holders (set of 3), $14.99 from Ikea. Midnight Massacre desk lamp from Living Dead Creations. Spine candles by Daniel Tyrkiel. 10″ red taper candles from Dollar Tree. Or these bleeding taper candles. Bloody hand towels from Heather Hutchinson/Pinterest. Salong red vase, $7.99 from Ikea. 50 plastic test tubes with aluminum rack , $25.99 at Amazon. Bloody window treatment from Muse Lodge. Bloody bath mat from Perpetual Kid. Antonio Murado Salome 14-piece set (sold out) from the New Museum/via Haute Macabre. Not pictured: red flatware; more blood-themed housewares. Hope you found this concept helpful! Up next: Halloween Week 2011: Witch Party Concept.